Since SellingYourScreenplay.com launched in early 2009 my main focus was in trying to help people sell their screenplays. That focus has remained constant and I continue to add more and more products and services to help people sell their screenplays. I’ve published many free articles about how to sell your screenplay and created many tools for screenwriters. Many people have found success using the various products and services that I offer. You can see some of the success stories here: http://www.sellingyourscreenplay.com/success/. By joining Selling Your Screenplay Select you will be taking the first step towards a professional career as a screenwriter. Screenwriters upload their screenplays, along with a log line, synopsis and other pertinent information like budget and genre. And then producers search for, and hopefully find, screenplays they want to produce. As an SYS Select member you can list as many screenplays in the database as you’d like. Finding real opportunities to submit your material or legitimate paid writing assignments is no easy task. Selling Your Screenplay has partnered with one of the premier paid screenwriting leads sites so that we can syndicate their leads to SYS Select members. Several times per week we send out emails to all SYS Select members with our partner’s real, legitimate screenwriting jobs. These jobs range from producers looking for spec scripts, to production companies looking to hire a screenwriter to write a script based on some preexisting material, to universities looking to hire a screenwriting teacher. Consistently responding to these leads is the fastest, easiest way to begin working as a professional screenwriter. Each month SYS sends out a newsletter with log lines from SYS Select members to producers, agents, and managers. The people who receive this newsletter have expressed an interest in receiving pitches from the SYS Select community. This is a very targeted list of people and companies who are actively seeking material so it’s a great way to get exposure for your screenplays. Questions Answered in Our Screenwriting Forum – If you have any questions about screenwriting, by joining SYS Select you will have access to our screenwriting forum where you can ask as many questions as you’d like. In the forum you can ask any screenwriting related questions you have, from trivial beginner questions all the way up to the most advanced screenwriting questions, and they will be answered. Many people get bogged down with questions that could be easily answered by someone with experience. By joining SYS Select you won’t be one of them. Log Line Critique – Inside our screenwriting forum you can post your log line and we will critique it to help you make sure it is up to professional standards. Also, inside our forum, there are dozens of critiqued log lines that you can read over and learn from. The log line is the single most important tool you have in selling your screenplay, so having a good one is essential. By joining SYS Select you’ll be confident that your log line is as good as it can be. To learn more about writing a professional log line check out my post: Writing A Screenplay Log Line. Query Letter Critique – Inside our screenwriting forum we will critique your query letter and help you make sure it’s up to professional standards. Inside our forum, there are several professionally written query letters that you can use as templates for your own letter, as well as dozens of critiqued query letters that you can learn from. Having a professional query letter is one potential tool to help you get agents, managers, and producers to read your screenplay. By joining SYS Select we will make sure your query letter is professional. To learn more about writing a professional query letter check out my post: How to write a professional query letter for your screenplay. I will be running occasional live online courses taught by myself or another industry professional. All the online courses are taught by real industry professionals with real credits, not “gurus” or “best selling” authors who have never actually worked in the business and don’t have any real, verifiable credits. In addition, all online courses are recorded and are available for members to watch or listen to at a later time so you can learn at your own pace. For a full list of all the online courses available to SYS Select members, please click here. By joining SYS Select you will have access to all current and past online courses. Once your log line and query letter have been critiqued in the screenwriting forum, you can purchase our email and fax blast service. We currently have more than 500 email addresses and fax numbers for agents and managers in our database. We currently have more than 4000 email addresses and fax numbers in our database for producers. For current pricing of the email and fax blast service and to learn more about it click here. Our email and fax blast service is the quickest, easiest way to jump start your screenwriting career. Many screenwriters have optioned screenplays, found representation, and found paid screenwriting jobs as a direct result of our email and fax blast service. By joining SYS Select and doing one of our blasts, you could be next. Inside our screenwriting forum, you can join an active writer’s group where you will receive notes on your work as well as give notes on other people’s work. Reading other writer’s material and getting feedback on your own is a key ingredient to growing and improving as a writer. In addition, by joining an active writer’s group, you will gain a measure of accountability to keep you motivated and producing pages as you will be expected to present your pages on a specific date each month. 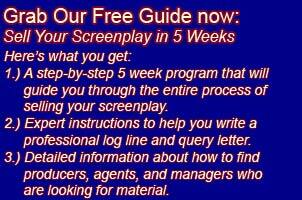 By joining SYS Select you get your very own screenwriter website. We’ve built a simple admin interface (no html or programming experience needed) so you can build a professional looking website to highlight your career as a screenwriter, list log lines, synopses, and some background information on yourself. Your screenwriter website will look something like this: www.ashleymeyers.com. To learn more about how a webpage can be a valuable marketing tool for a screenwriter check out this post: Why you need a screenwriter website. You get all of these great materials, features, products, services, and tools by joining SYS Select. Previous post: How can I attach a director to my screenplay?